When you need high quality office furniture on a tight budget, you can rely on Sydney based Emanate Design to meet your required lead-time. As a local office furniture supplier with international connections, our clients in the corporate, hospitality and retail sectors return to us each time they undertake a complete fit out or a refurbishment because we deliver commercial furniture on time without sacrificing quality service. 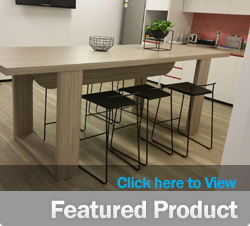 Australian owned, Emanate Design will manufacture, supply and complete the installation of your commercial furniture, whether it be corporate executive furniture, ergonomic chairs, office workstations and desks, Auditorium and Cinema seating, or retail, café and restaurant hospitality furniture. Our clients often comment on our ability to deliver high-end office furniture even when they are operating on a tight budget. This is due to our commitment to first class product and material sourcing. This quality is demonstrated by the fact that Emanate Design in Sydney was selected as the Australian manufacturing partner of Interstuhl office chairs for the Australian East Asian and Pacific Rim. Interstuhl is a highly respected European office furniture designer and manufacturer, based in Germany, which is consistently in the top five European commercial furniture manufacturers and has won numerous awards. Interstuhl specialises in ergonomic seating. Interstuhl is proud to announce to be the first German manufacturer of office furniture to satisfy the comprehensive evaluation criteria of the international assessment platform EcoVadis. The CSR Gold ranking issued in January 2015 places Interstuhl demonstrably among the top 7 percent of furniture manufacturers who act in a more proactive and responsible way than the average in relation to Corporate Social Responsibility (CSR). Sustainable commercial furniture is the buzzword right now for office fit outs and refurbishments. Emanate Design recognises that companies are working towards corporate sustainability goals and quality accreditation. To support this, we offer Greenguard and Blue Angel certified environmentally friendly products and Furntech / AFRDI blue tick accredited office furniture. While we are based in St Peters, Sydney, Emanate Design works with and delivers office furniture to clients throughout Australia including Orange, Newcastle, Canberra and Melbourne. Our clients constantly praise our professional staff, so whether you want high-end executive furniture or simple office chairs and desks, corporate, retail or hospitality, regardless of your budget, call Emanate Design today for a chat.